Hundreds of animal rescuers like us had entrusted Ms. Leah Purcell during the past year with our dogs, in return for payments of from $750 to several thousand dollars that were ostensibly for Purcell’s boarding and training of the dogs and her help in finding adopters for the dogs. In reality, barely a handful of those dogs have been adopted, and even those remain unverified and unidentified by Ms. Purcell. Further, Ms. Purcell's purported "refuge" was not even a legal nonprofit rescue; it was and still is an operating for-profit business, and apparently it was making a pretty hefty profit. Spindletop and Leah Purcell had enjoyed a fine reputation among pitbull rescuers, although it was little known that the “refuge” had lost its nonprofit status years ago. Ms. Purcell had also gained fame with her “expert testimony” in the trial of Michael Vick regarding his fighting dogs. On the recommendation of other rescuers who had trusted their rescue dogs to Purcell, On Wings Of Care flew our precious Scarlett to Spindletop last November 6, 2011. When we drove to the ranch and met Leah, we were satisfied by the look of the ranch and by the interactions we witnessed between Scarlett and Leah and between Leah and the other dogs in enclosures around her house. We left Scarlett feeling that this might truly be a positive step in her life. We became concerned in the ensuing weeks because we had great difficulty reaching Leah and she did not volunteer clear information about how Scarlett was doing or how adoption prospects were being sought. But each time that we persisted and managed to reach Leah by phone, she assured us that Scarlett was doing beautifully. By early December, she told us that Scarlett was being fostered at a friend’s ranch, and that the friend liked her so much that she planned to adopt Scarlett. We believed that Scarlett’s forever home had finally come true, and, finally, we rested easy about our having left her care and fate to someone we believed was more able than us to provide for it. We even shared Scarlett’s “success story” on our website. Our response to the news of the raid on Spindletop was a combination of shock and enormous concern for our dog Scarlett and all of the other dogs. 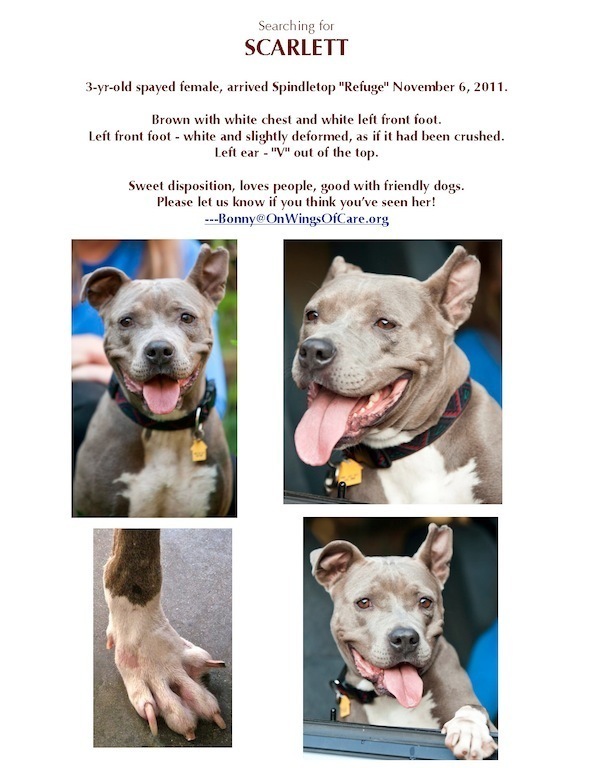 Immediately, we prepared email folders containing all information about our Scarlett’s health history, her microchip ID number, and many photos and descriptions of her uniquely identifying features. We sent these to everyone involved in the case -- the District Attorney’s office, the local Animal Control in charge of the confiscated animals, and representatives from the Humane Society of the United States (HSUS) and the Animal Farm Foundation (AFF) who had been contracted by Montgomery Country to tend the confiscated dogs at the Montgomery Country fairgrounds in nearby Conroe, TX. In our desperate efforts to find Scarlett and rescue her from this hell to which we had unwittingly brought her last November, we even contacted Ms. Purcell and her defense attorney, Ms. Zandra Anderson. To our surprise and huge relief, Ms. Anderson replied to our email! She assured us that Scarlett was alive and fine, that she had been confiscated with the other dogs, and she even told us that Scarlett could be found in the temporary shelter in HSUS kennel numbers 1--178! 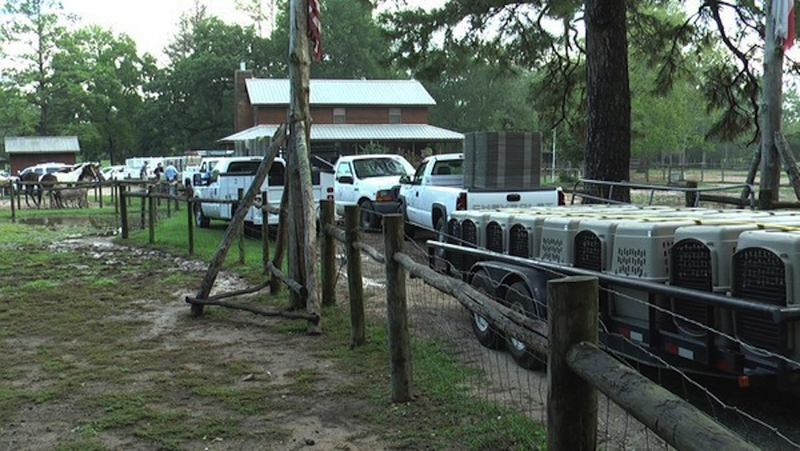 With this prompt and detailed reassurance coming from Purcell's attorney, it seemed to us -- and to others to whom she gave the identical assurance and information -- as though Ms. Anderson was really trying to help the dogs and their former owners. That, in turn, made us wonder if perhaps there were at least some understandable circumstances (not excuses) that might have contributed to Purcell having kept so many dogs in such inhumane conditions. The only problem is, Ms. Anderson’s information was not correct. Not for Scarlett, and not for the vast majority of other dog owners to whom she gave similar or identical information. After a few days, Ms. Anderson stopped replying to inquiries from dog owners altogether. We also learned that what Purcell had told us about Scarlett's being adopted by people on a ranch was exactly what she had told many other dog owners about their dogs. Where are all these ranches, who are all these wonderful adopters? Not a word has been heard from a one of them. The wheels of justice seem to move swiftly in Texas. But maybe not so surely. Join us for this ambitious rescue campaign! To our friends who know that killing adoptable animals is not the "kindness" that humans or animals need! Right now, there are at least 50 healthy, highly adoptable dogs in Devore (San Bernardino county, CA) who need out before this weekend or they're toast. And almost that many in Fresno county in the same dire straits. Next week, there will be at least 50 more! Unless you're there or on some of these distribution lists, you'd find it hard to believe how many perfectly wonderful animals wind up in these "shelters" (NOT!) and are killed within five days! No 'adoption day' for these dogs, not even time for anyone to come on the weekend to see them! It's going to take more than one transport flight per month even to begin to get the best of them out alive, especially since many of the dogs are medium to large in size, which means we can't always take 15-20 at a time like we can with the little ones. We have rescues from all over Washington and Canada willing to take these dogs right now, but we don't have funds to get them all there. Flights, as opposed to long drives, are still the most efficient and economical and comfortable way to take the animals these long distances. And our small single-engine planes with high payload capacity can carry the most animals for the least operational costs. But we're working on ways to do even better. For starters, we're actively seeking other volunteer pilots with planes to help on some or all of these flights. Groups like Pilots 'n Paws are hard to pin down because their volunteer schedules are so changeable, but whenever possible we try to team up with them in order to transport more dogs at one time, and increase safety by having more than one plane flying these rugged and remote routes. In the end, the number of trips we can make and the number of dogs we can save really just comes down to how much support we get from people like you to cover our fuel and other airplane operating costs. We'll always offer our services at no cost, but it takes fuel and oil and mandatory safety inspections and maintenance to keep us flying On Wings Of Care! With the transport capabilities in place, and the rescuers and fosters and adopters ready, we want to start emptying out the tragic high-kill shelters that still exist in southern California. This, together with media exposure, is what we need to successfully pressure county legislators to change the practices at these shelters, to allocate their funds more wisely, to begin allowing more use of public volunteers and public donations in ways that have proven so very successful in hundreds of no-kill shelters across the country. In this age, there is no excuse for cruel and needless mass killings of animals that are healthy and highly adoptable as companions to humans. Please help us spread the word, share the joy, and save more animals and people by bringing their hearts together for life! Many thanks, again, for all your help. -- Bonny, Dave, Deb, Brayton, Brett, plus hundreds of fellow rescuers and over a thousand critters (so far!) who are here and saving lives thanks to On Wings Of Care!